To say I am picky about my methods of hydration is an understatement. Let’s face it – I drink A LOT while training and racing. Some people give me odd looks and/or make fun of me. I don’t care. I’m a thirsty girl. Of the many lessons I’ve learned over the years one of the most important for me is to HYDRATE! Waking up in an ambulance after collapsing on a race course from a heat stroke will do that to you. Hydration is easy on the bike – so many options and places to store bottles of fluids. There are also various options for running – handheld bottles of varying sizes, waist packs that can hold multiple flasks/bottles/gel packs, etc. And then there are packs. All of them have their positives and negatives. If you are anything like me you’ve probably tried them all. I’m at the point where upon opening my “gear cabinet”, run-specific bottles and flasks come a-tumbling. I like options. Handhelds are okay for shorter runs, but I get really annoyed by carrying anything in my hands. Waist packs can also be good for shorter runs, and they offer options for conveniently carrying other gear like keys, food, and you cell phone. However I don’t always have the easiest time removing and replacing the bottles while I’m running. And of course there is inevitably some sort of “bounce” factor. My favorite way to go is the pack. They can hold large amounts of fluid which sets my mind at ease, and most have extra storage/pockets for other goodies. 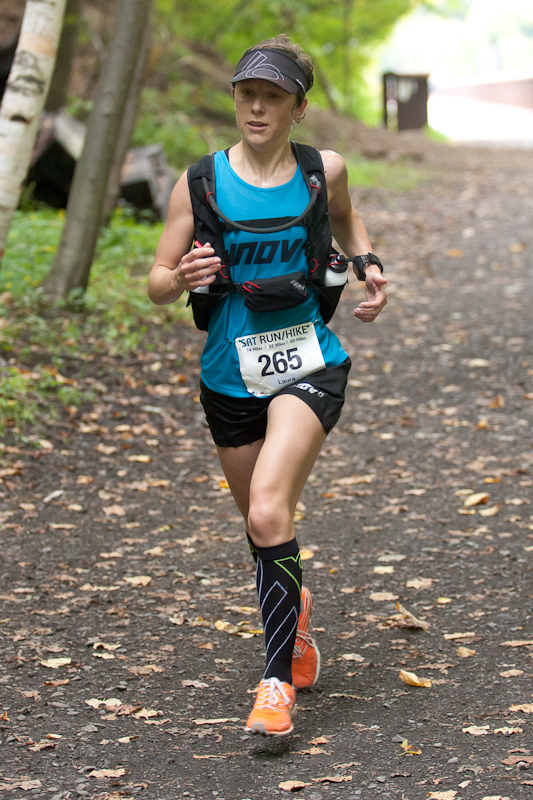 Although I prefer packs, there are times when they just seem like “too much.” That was until the inov-8 Race Ultra Vest came into my life. It may sound cliché, but it was a game-changer for a hydration junkie like myself. A dream come true for a thirsty minimalist! As soon as I strapped it on I was in love. Confession time: when it first arrived I actually wore it around the house that day. I was so excited by its sleek design and badass look I just couldn’t resist! And the comfort? Okay it was empty at the time but it fit unlike any pack I’ve ever tried. With adjustment straps across the chest and on the sides you could practically mold this bad boy to your torso. 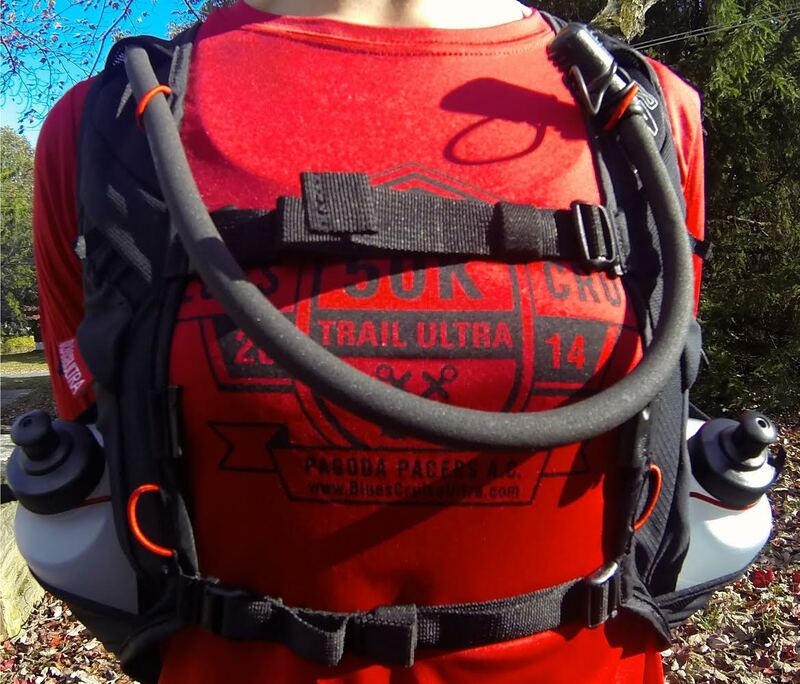 A hydration vest that works well for a petite female? Pinch me! The first time I used the vest I opted to fill the reservoir only which holds 2 liters. The reservoir fits nicely into an insulated sleeve which then drops into the large stretch mesh pocket in the rear. The straw is insulated as well and can be fed through the shoulder straps on either side of the pack. The nozzle has an on/off option and a cap that can either be used to keep dirt out or be removed entirely. I tend to use the cap only during travel and remove it when it’s time to run. When using the pack without the bottles this opens up 2 large pockets in the front to stash lots of handy items – cell phone, trail snacks, etc. But fear not, there are still 2 additional stretch mesh pockets on each side that although may be narrow at the opening (which is great for security like your key and/or money) can hold a lot of items as well! I set off on my run with a full pack and immediately fell in love with the snug fit that kept the vest from bouncing around. I realized that I would be relying heavily on this vest for training runs! The big question for me – would the addition of the 2 – 500 ml bottles throw me off by making the pack too wide? Surprisingly they were not in the way at all. They are angled in a fashion as to not hinder your arm swing, which also makes them easier to retrieve and replace on the run. Each pocket has a bungee strap that stretches over the cap to keep the bottles from flying out on rugged terrain. The small pull tab make the bungees easy to maneuver as well. So now I can have 2 liters of water and another 1000 ml of electrolyte drink. Score! Other cool things to mention? The whistle that is latched onto the chest strap of course! 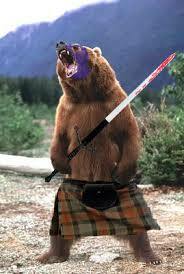 Go ahead bears, try me. Although the vest is not made for a ton of storage, the reservoir pocket on the back is stretchy enough to allow for some gear. So far I’ve used it for a trail map (I’m forever getting lost), gloves and sleeves. I’m sure you could stash a few other small items in there as well. I’ve now raced twice with this pack – once with the bottles and once without. Complaints? None that I can find yet! And although I’ve (mostly) given up wearing it around the house, I have definitely put some miles in. I’ve even used it on a shorter run that required me to carry some gear. I removed the insulation sleeve and reservoir and had lots of space to store things. So there you have it – the Race Ultra Vest is the perfect fit for me. It’s no surprise that this vest has been the recipient of some big time awards. If you love getting lost in the trails for hours and are looking for a minimalist pack that provides all the necessities while at the same time is barely noticeable – I highly recommend you check this one out! 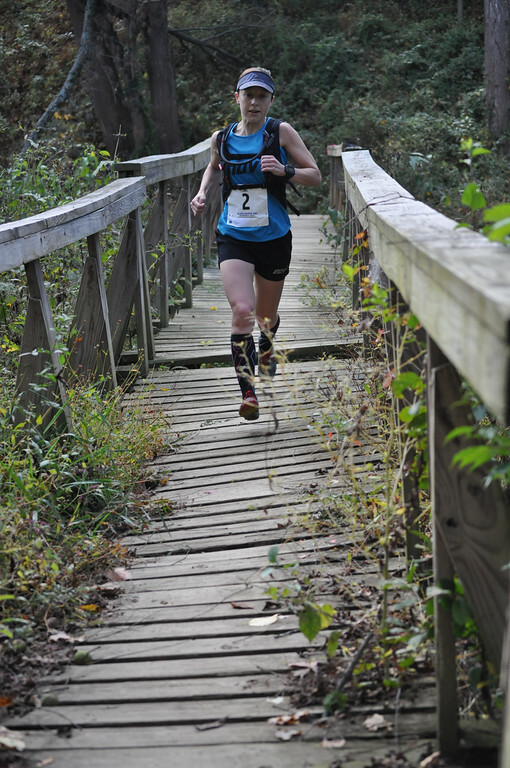 This entry was posted in inov-8, product review and tagged inov-8, race ultra vest, running packs, trail racing, trail running by lljkline. Bookmark the permalink. Adjustable sides!!! This pack looks amazing! I can’t get over the adjustable sides – it’s such an “of course” thing, but so many hydration vests only adjust the length of the shoulder/chest/waist straps and you have to hope the rest of the pack fits. Adjustable sides!! !